Bob Dunn, behind Lonnie Glosson, from a group photo published by XEPN, Piedras Negras, Mexico, c.1938. Continuing in Old Time Blues’ tradition of honoring the heroes of western swing music, this post is dedicated to a figure of immense significance to the genre, the father of electric steel guitar, Bob Dunn. Robert Lee Dunn was born in Fort Gibson, Oklahoma, on February 5, 1908. The son of a fiddler, Bob followed in his father’s musical footsteps, taking up slide guitar and playing Hawaiian music, as was enjoying a surge of popularity at the time, drawing influence from leading players such as Sol Ho’opi’i. Inspired by the music of those like Jack Teagarden, Dunn soon shifted toward jazz, and added an electric pickup to his guitar, playing in an idiosyncratic brassy style peculiar to him. In the late 1920s, he played in groups such as the Panhandle Cowboys and Indians, before winding up in Fort Worth in 1934. There, he joined Milton Brown’s Musical Brownies, with whom he pioneered the use of steel guitar in western swing music. He made his recording debut in the Brownies first Decca session on January 27, 1935, purportedly earning him the distinction of being the first musician to record with an electrified steel guitar. Dunn remained with the Brownies until Brown’s untimely death in 1936, after which he went on to play with Roy Newman’s Boys and Cliff Bruner’s Texas Wanderers before forming a band of his own—the Vagabonds—with whom he made several records for Decca from 1938 to 1940. 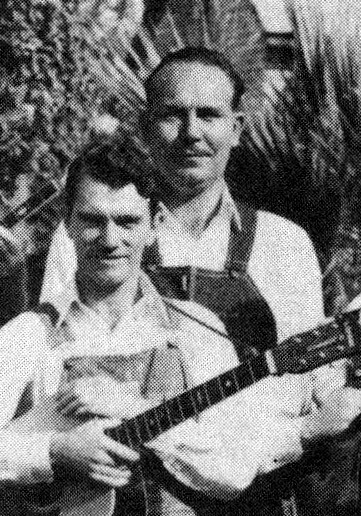 After the Vagabonds broke up, Dunn played in a variety of different western swing bands, including Bill Boyd’s Cowboy Ramblers, Dickie McBride’s Village Boys, Bill Mounce’s Sons of the South, and the Sons of Dixie. He retired from his performing career in 1950 and opened a music store in Houston. Bob Dunn died on May 27, 1971. Decca 5828 was recorded on April 11, 1940 in Houston, Texas at Dunn’s Vagabonds’ last session. The Vagabonds are Bob Dunn on steel guitar, possibly Rudy Rivera on clarinet, Sam Jones on electric tenor guitar, an unknown second guitar, Mancel Tierney on piano, and Hezzie Bryant on string bass. On the first side, Dunn shows off his unique style of playing on his hot instrumental composition “Juke Box Rag”. 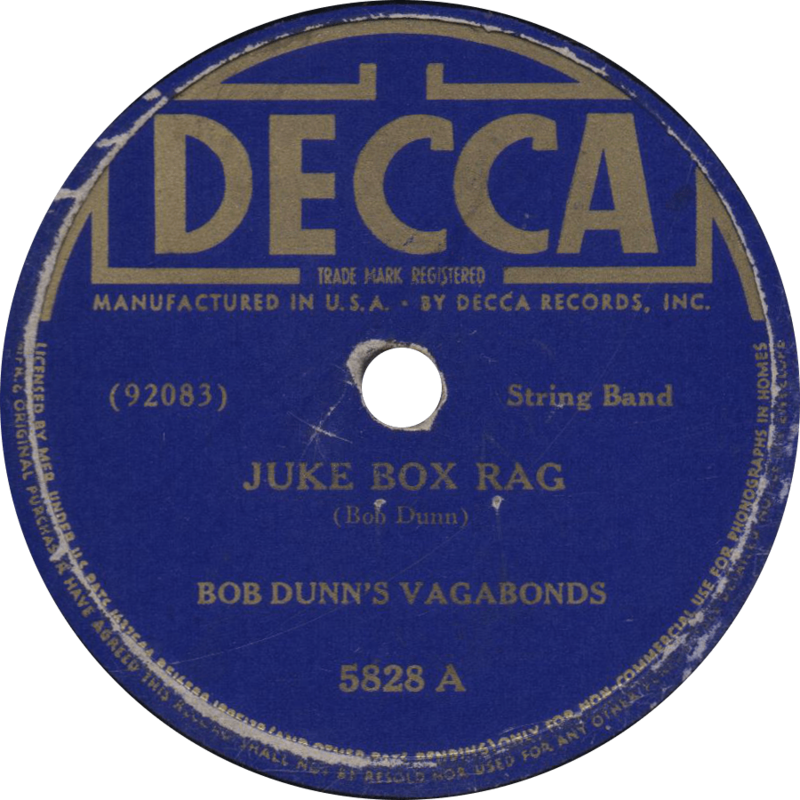 Juke Box Rag, recorded April 11, 1940 by Bob Dunn’s Vagabonds. Next, Dunn himself sings a crooning vocal on another of his own compositions, “I’ll Forget Dear (That I Ever Loved You)”. 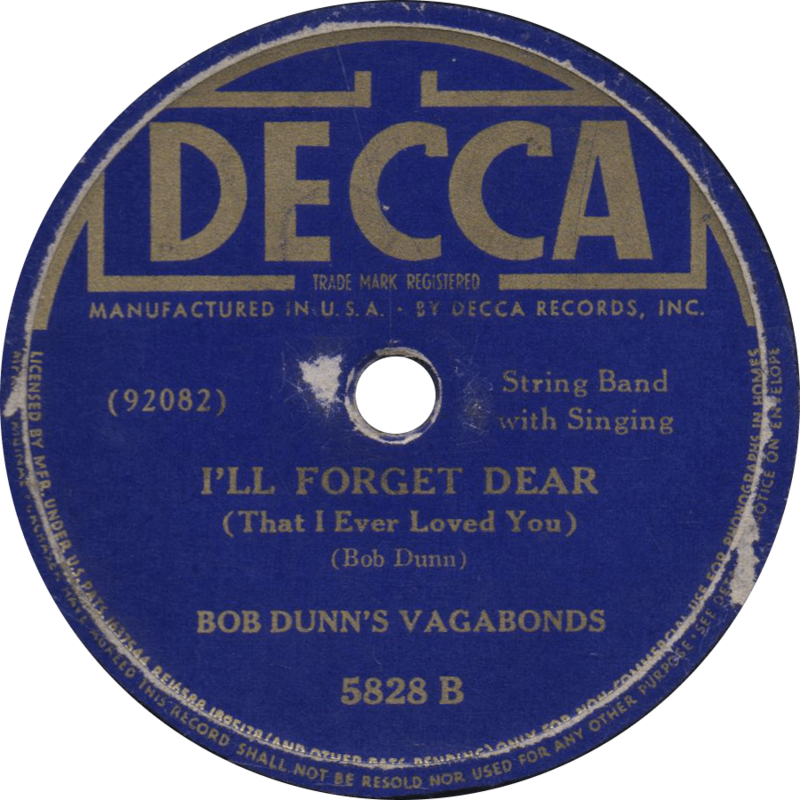 I’ll Forget Dear (That I Ever Loved You), recorded April 11, 1940 by Bob Dunn’s Vagabonds.